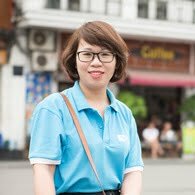 Arrive in Bangkok, be welcomed by your private guide and driver, and then transferred to your hotel. Check in and enjoy your time of leisure. All meals are on your own arrangement. 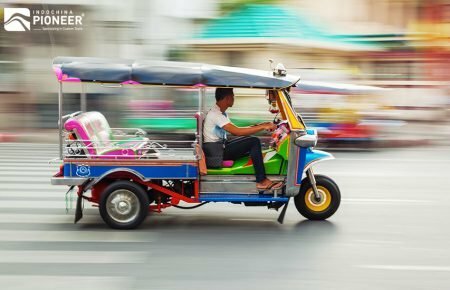 Be picked up from your central Bangkok hotel, sit back and relax as you journey through the bustling streets of new Siam. Listen to your knowledgeable guide as he highlights the passing attractions on your way to Wat Traimit, temple of the Golden Buddha, housing the world’s largest solid-gold Buddha. Appreciate the intricate architecture of this temple and then witness the Golden Buddha, standing 10 feet (3 m) high and weighing 5.5 tons. 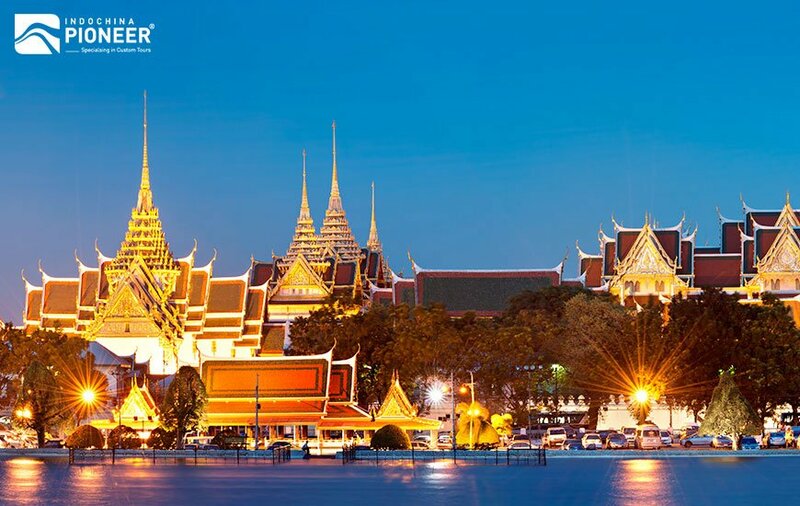 Proceed to Wat Pho, temple of the Reclining Buddha, the largest and oldest of its kind in Bangkok. 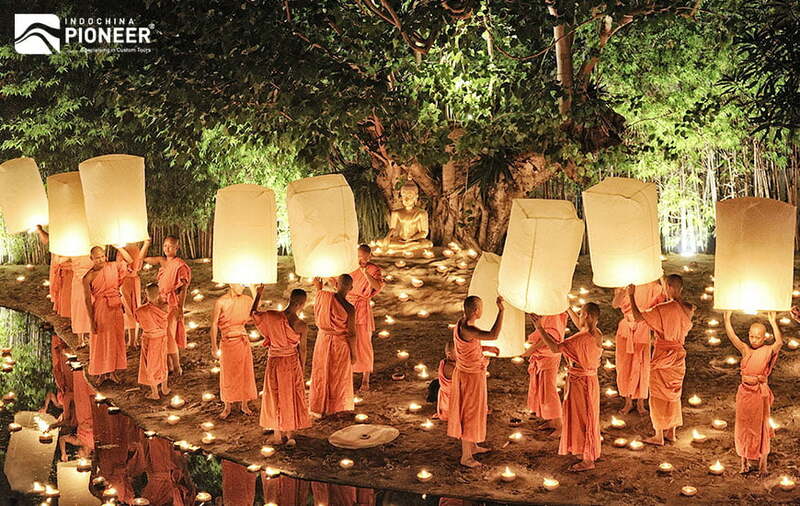 Observe the Buddhist ritual practiced by the monks and believers, and learn about this temple’s history. Continue your journey to an incredibly striking temple, Wat Benchamabophit, the Marble Temple, named after the Carrara marble imported from Italy with which the ubosoth (a structure for ordinations) was constructed. Notice the breathtaking marble structures as you stroll along the interiors of the temple and admire the architectural mix of Italian marble and Siamese culture. Back to the hotel and enjoy your time of leisure. Today you depart Bangkok to the Ratchaburi province. On the way, visit a local palm sugar factory. 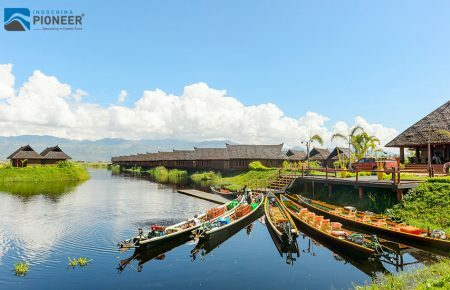 Traveling by long tail boat, cruising along fruit plantations to visit the most well-known floating market in Thailand – DAMNOEN SADUK Floating Market. Continue to Kanchanaburi province and enjoy lunch at local restaurant. After lunch visit a World War II cemetery and Jeath War Museum. You then take long tail boat along the Mae-Klong River to the bridge on the River Kwai. Visit the dazzling SaiyokNoi Waterfall and then check in at your hotel to rest for the night. 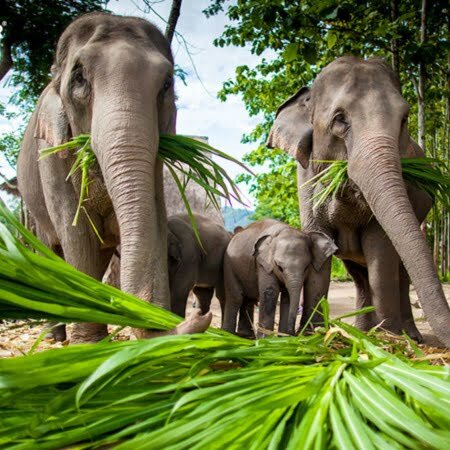 Check out & depart hotel to visit Erawan Waterfall at Erawan National Park. Lunch will be served at a local restaurant. In the afternoon, you take your train ride along the Death Railway before transferred back to Bangkok, check into your hotel and rest for the night. Morning transfer to Bangkok Airport to take a short flight to Chiang Mai. 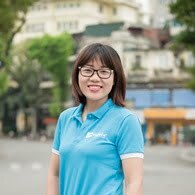 Arrive in Chiang Mai…Meet & greet local guide. Then transfer to hotel. In the afternoon you take a drive on the winding road to see the DoiSuthep Temple, the most important temple in Chiang Mai. You’ll get a little exercise by walking up 306 steps to the temples or just lazily take the funicular to the temple with an altitude of 1,100 ms above the sea level. 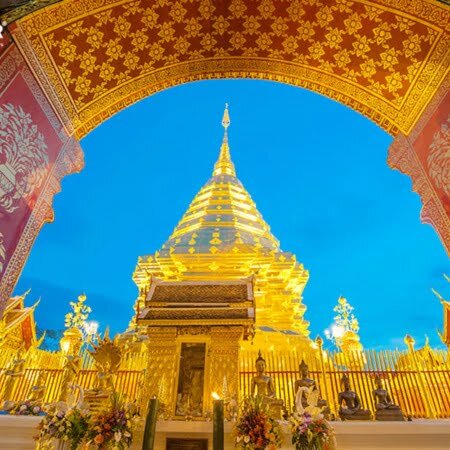 See the Northern Thai dented corner golden pagoda which contains the relic of Lord Buddha. The mural painting surrounding the hall tells the Lord Buddha story. Here you can get a chance to get a holy blessing and wrist tiding ceremony from the Buddhist monk. From the balcony, enjoy the panorama view of Chiang Mai. Birds fly up in the sky and you will feel a cool breath against your face. You then come back to the city to see the Suan Dork Royal Temple where the northern royal family tombs are located and the standing Buddha Image, the only one in holding the blessing stick position in Chiang Mai. 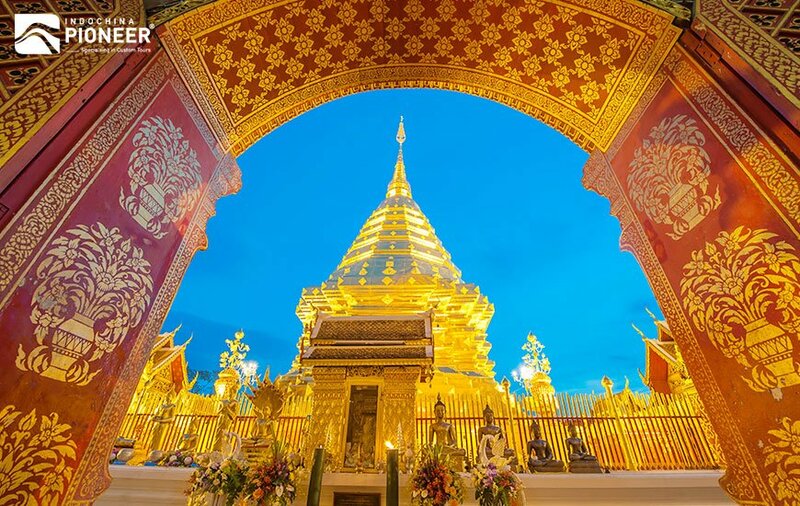 Visit Wat ChediLuang or The Grand Pagoda Temple where you can see the biggest pagoda in Chiang Mai which was broken down by the earthquake in 1454. You still can see the gigantic pagoda standing gracefully in the middle of the temple grounds. 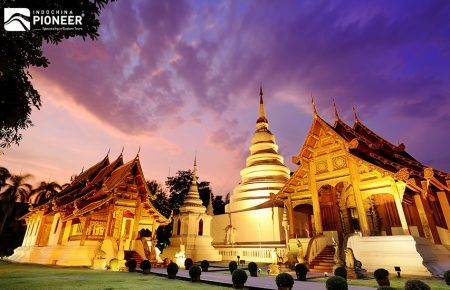 Before the returning back to the hotel, see the Wat Chiang Maan, the first temple of the royal resident of King Mengrai of Mengrai dynasty. 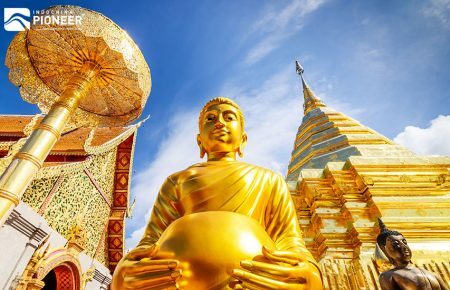 See two precious Buddha images “Phra Satangkamanee ” and “Phra Buddha Sila” which are important for Chiang Mai people. This morning you head southward on high way no.108 to DoiInthanont National Park, the highest peak in Thailand at 2,565 meters above the sea level. Along the 44 kilometres up the mountainous road, you’ll enjoy the beautiful scenic view and the lush green nature of the forest. On the highest peak of Thailand you can see the stupa of King Inthawitchayanon, the last King of Lanna Kingdom before Siam became Thailand later on. At the peak, stands the stupa of the king among the cool summer climate and cold winter climate. Nearby the stupa, there is a radar control station of Thai Lada Air Force to monitor the borderline between Thailand and Myanmar. 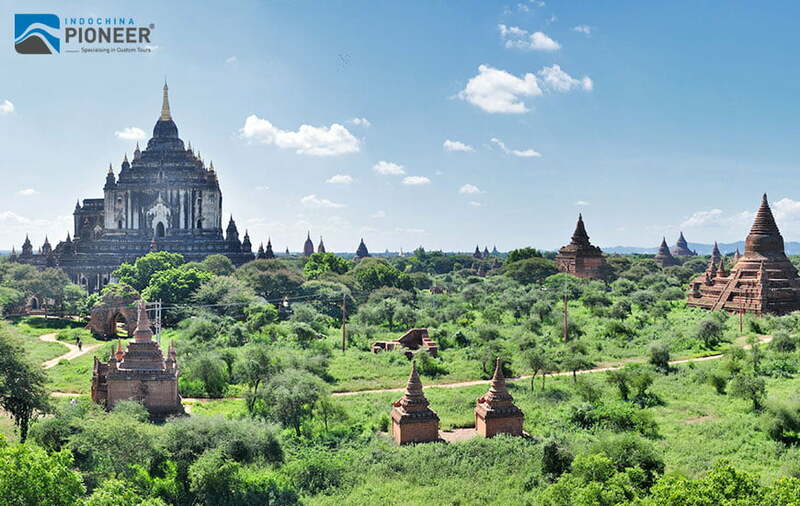 After visiting the stupa of King Inthawichayanont, enjoy a 30-minute walk on the Angka nature trail. See the lush green forest area and feel fresh with the cool mist against your face. Then, continue to the Twin Pagodas, built for King Bhumiphol and Queen Sirikit of Thailand as the 60th birthday gifts by the Thai Lada Air Force Radar station and locals. Inside the pagodas, see the beautiful art which telling about the Lords Buddha. Then visit Hmong hill tribe market where they sell vegetables and fruits products and have lunch at a local restaurant. After lunch, you will meet your new friend from the “Pa KaYor” Karen hill tribe who will lead you on a walk through the forest to his village. Start your walk into the pine forest area, follow the small pathway deep in to see the “Pha Dork Siew Waterfall,” one of the most beautiful waterfalls in this area. See the beautiful scenery, lush green forest and vast of biodiversities of life. The walkway has both an easy walk and an exciting one. Stop close to the waterfall to swim and relax in the fresh cooling water. 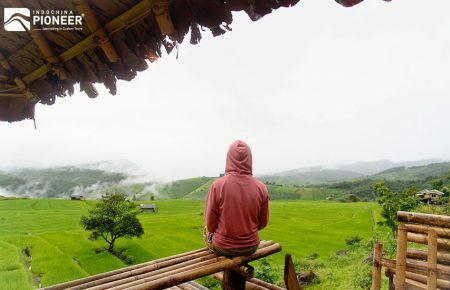 Enjoy refreshing views of the waterfall before continuing the walk through the terraced rice fields and coffee plantation that belong to the Karen Hill tribe who work for the King’s Royal project before reaching the village. After resting, have some fresh Arabica coffee which comes from the village before visiting the Wachiratharn Waterfall. At 750 meters high, admire the strong powerful current of the water and feel the fresh spray against your face. Take an easy short walk around to take photos before the returning to your hotel. Today is at your own leisure to explore Chiang Mai and to unwind. 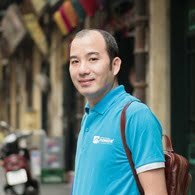 Upon your arrival in Mandalay, be welcomed by our tour guide and transferred to your hotel for check–in. After breakfast you’ll board a private local boat for a trip up the Irrawaddy to Mingun (45 min each way). 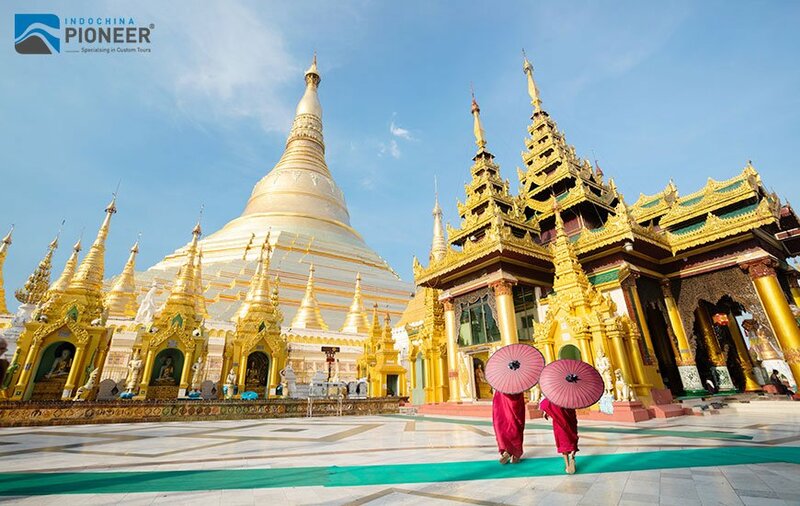 Visit the Mingun Bell, the world’s largest intact bronze bell weighing more than 87 tons, and the unfinished MingunPaya (built with the intention of being the world’s largest pagoda). 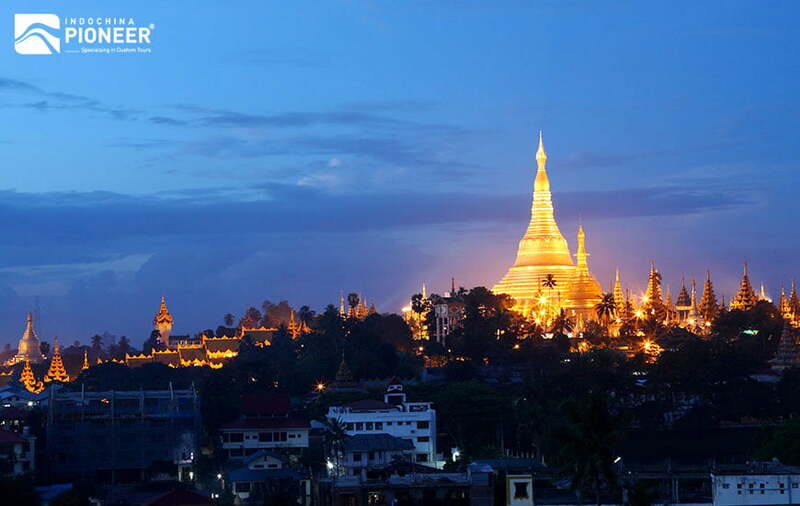 Mingun’s other highlight is the Hisnbyume Pagoda, a white–washed temple built to resemble Mount Meru. 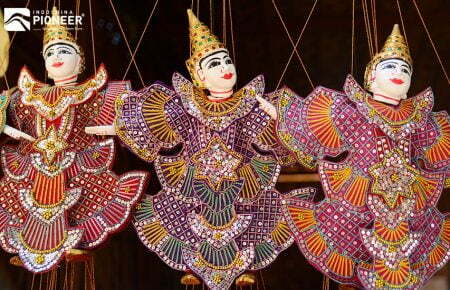 Throughout Mingun there are small neighborhoods crafting traditional basketry and other artistic handicrafts. There is plenty of time to stop and interact with the craftsmen and friendly locals. After returning to Mandalay in the afternoon, continue sightseeing and visit the Royal Palace ruins. 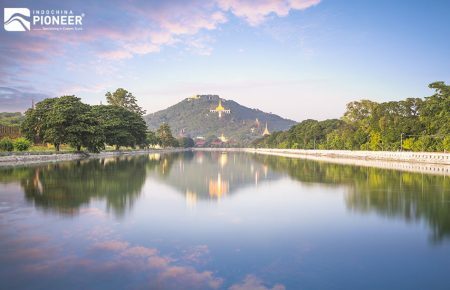 Continue to Sagaing Hills, a retreat for Buddhist devotees to watch the sunset. After breakfast drive to Monywa (140 km – 4 hours) in the morning and then visit Thanboddhay Pagoda. Inside, you will see thousands of Buddha images (reportedly over 500,000) decorating every wall, archway and niche. The buildings in the compound have interesting jataka reliefs. Continue your tour to visit the Bodhi TataungLaykyunSekkya standing Buddha statue. At 116 metres, it is the second tallest statue in the world (and second tallest Buddha). It is located at the back of a large religious site with Bodhi trees, gardens containing hundreds of sitting Buddhas, and a huge reclining Buddha lying in front of the Laykyun Sekkya. 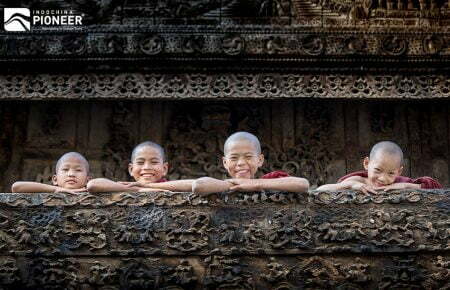 Rise early to take the ferry to the other side of the Chindwin River where you board a pick–up to see the seldom visited 15th Pho Win Daung temple complex where more than 450,000 sandstone Buddhas were carved in the hillsides in caves, alcoves, or tiny niches. The cave murals are still intact with indigo blues and soft pastels. 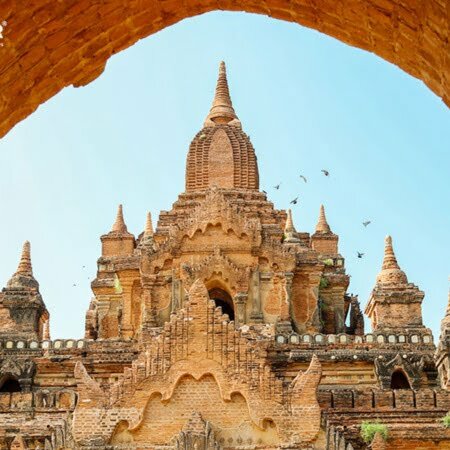 Then, visit Shwe Ba Daung, which features unique pavilions cut from the surrounding sandstone and filled with Bubddha images. After breakfast, drive (approx. 4 hrs) to Pakokku to experience a genuine indigenous regional open–air market. Then, take a private local boat across the Ayeyarwaddy River to Bagan (approx. 3 hrs by boat). Arrival Bagan and transfer to hotel. The rest of the day is at your leisure. 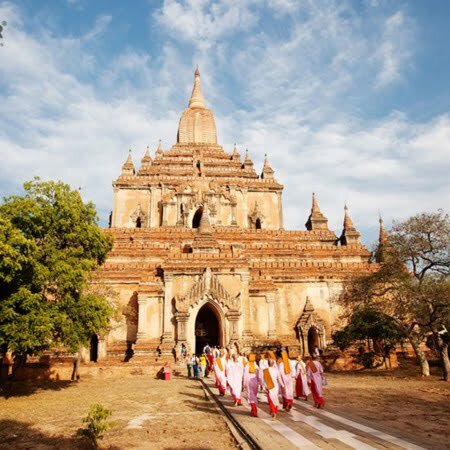 Begin your exploration by visiting a busy local market and gaining an insight into Bagan’s bustling market atmosphere. 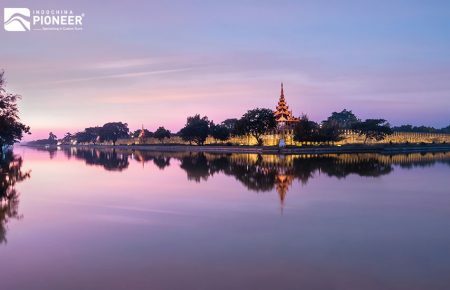 You will spend the day exploring the architectural masterpieces of this amazing town by visiting a diverse selection of the most important pagodas and temples. In the late afternoon, climbto the top of the Temple for sunset views. 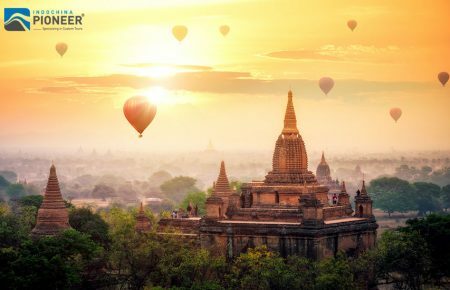 Sit back, relax, and be amazed by the beauty of Bagan as you watch the sun slowly set behind the ancient pagodas. More than just temples, your tour introduces you to Bagan’s history, culture and local lifestyles. 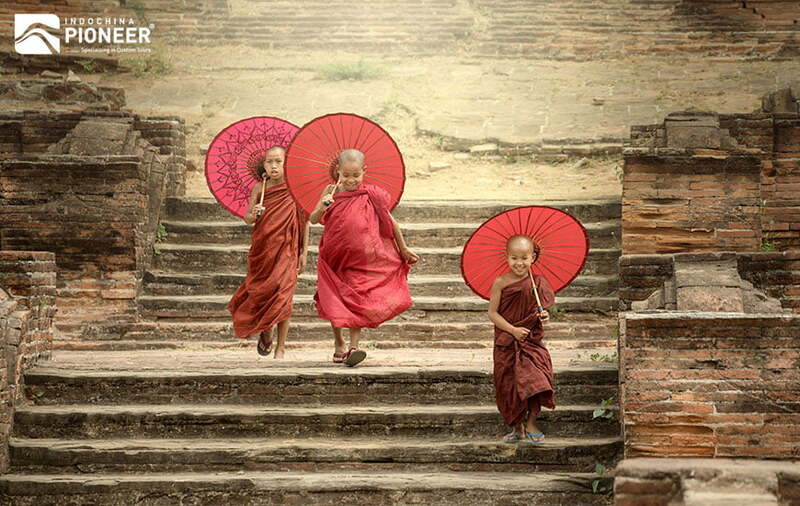 Today, observe the authentic village lifestyle lived by most people in Myanmar by visiting villages near Bagan. 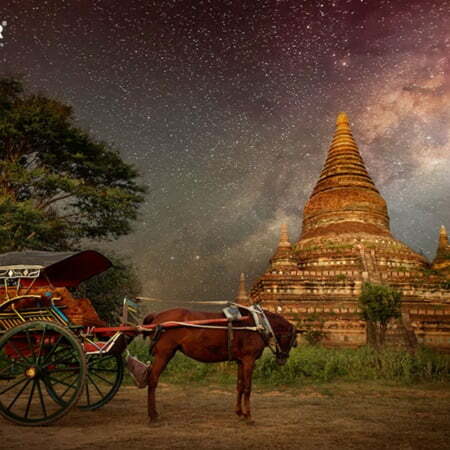 Then, get to know Bagan from a different perspective as you explore the area by pony cart. The cart can explore areas that cars are unable to enter giving a unique perspective of Bagan. In the late afternoon, transfer to the jetty where a private wooden river boat is waiting. Sitting under the shade or on the open–deck, you’ll be treated to fabulous views as you cruise down the Irrawaddy River to Shwezigon Pagoda. Enjoy a spectacular sunset on a private boat tour on the river during. Relax and enjoy the scenery. After breakfast transfer to the airport to fly to Heho, a gateway to Inle Lake. 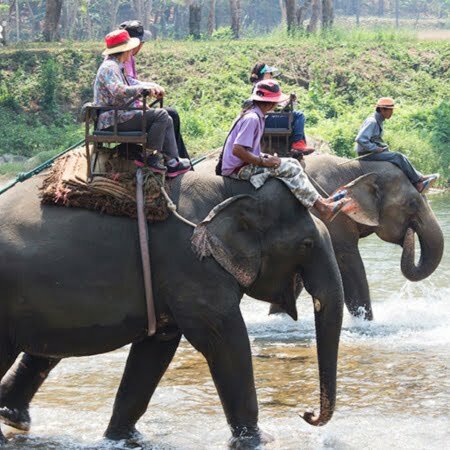 From Heho, drive to Nyaung Shwe where you board your boat & transfer to your hotel for check in. After a short rest you will enjoy the full day tour by private boat in Inle Lake. 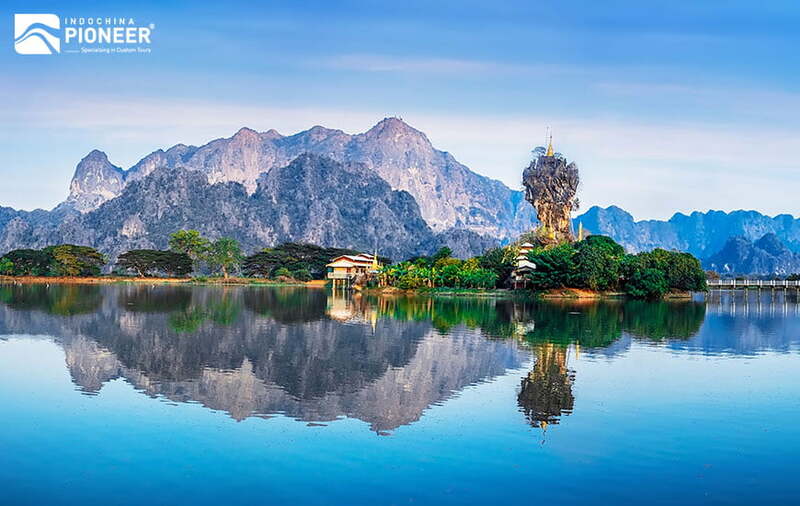 Visit the Phaung Daw Oo Pagoda, the most holy religious site in southern Shan State. 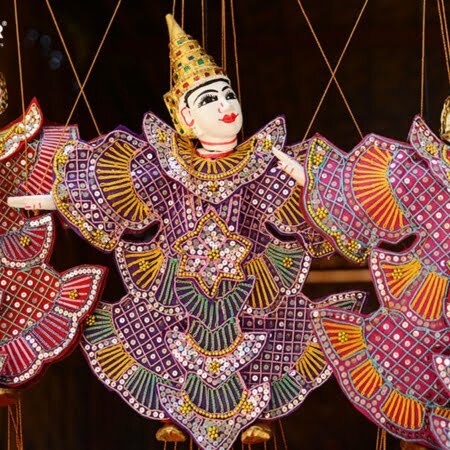 Be amazed by the local handicrafts, silk weaving, wooden handlooms and traditional blacksmith methods along the way. 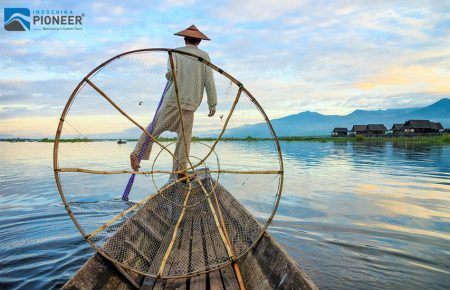 Visiting Inle Lake is not just about being on the water, but also about discovering the Shan and Intha villages on the banks of the river. Pass the endless floating gardens, houses, monasteries built on stilts on the lake. Proceed to the village of Nampan and see a local cheroot factory (where the Burmese cigars are made) and canoe carving. Begin your day with a visit to the market, which rotates locations every five days. 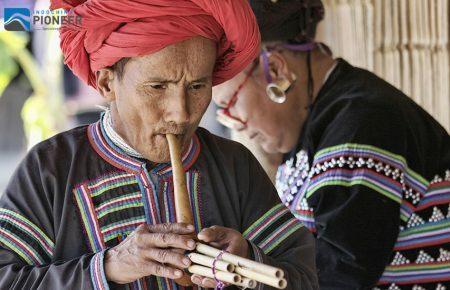 Witness the hill tribe people dressed in colorful, traditional outfits barter for goods and produce. You continue our sightseeing in Inle Lake, maneuvering by boat though long, scenic channels. You will visit the fascinating village of Indein, with its complex of ancient shrines and stupas and walk though exotic colonnades of stairways and shop stalls. Continue your tour to visit the “long neck” tribal women, and weaving and craft villages perched on stilts. 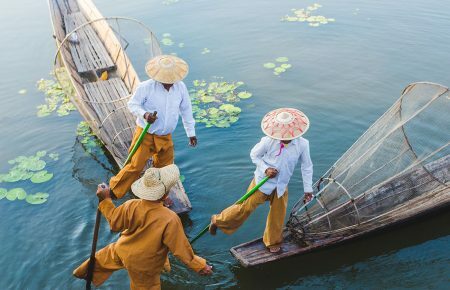 See the lake’s unique “leg rowers” – the Intha people row standing up with one leg wrapped around an oar. It is a feast for the senses and a photographer’s dream. Next, visit a unique Monastery on the Lake Nga Phe Kyaung, near Ywama village where the local Monks have trained the cats to jump through hoops. It is now affectionately known as the Jumping Cat Monastery. Today you will enjoy a sunrise hot air balloon flight over Inle is a unique experience. Depart the hotel before sunrise and transfer to the departure point (depending on wind). While sipping coffee/tea and having a croissant, observe how the crew inflates the balloons. A thorough safety briefing follows before you take off for a 45 minute to 1–hour flight. Upon landing, retrieve vehicles will be on hand to serve sparkling wine and refreshments before a transfer back to your hotel. The whole excursion door to door normally last between 2h30′ and 3h. Enjoy your day at leisure in NyaungShwe. In the late afternoon, you can visit Red Mountain winery for the sunset. Morning flight back to Yangon. Then, visit famous Chauk Htat Kyi, home to a 70–meter long reclining Buddha. The feet of the statue are carved with traditional symbols and many locals often gather there to pay homage and pray. Then, enjoy a visit to the sprawling 75–year–old Scott Market. At the market, you will find a whole variety of interesting Burmese souvenirs, from lacquer ware to gems & jewelry – bargain at the stores to fully experience the Burmese market atmosphere! Continue to drive through the city and observe the influences of other cultures in the region. 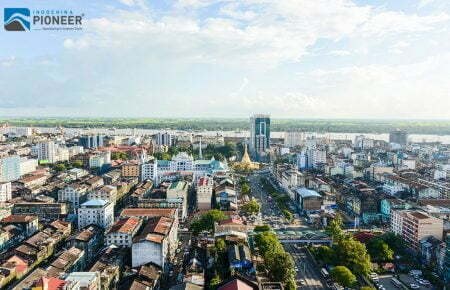 Interspersed in the tour are various religious sites such as the St Mary’s Cathedral, built in 1899, and over 100 year old beautiful Rangoon Synagogue. In there, you will have the opportunity to meet with Trustee of the Synagogue to learn about Jewish life in the Pagoda Land. End up your day by visiting Little India and Chinatown – stop to greet the vendors and let them introduce you to their wares – some familiar, some exotic. After breakfast, drive to the train station for a one hour circular train ride. Enjoy the authentic lifestyle of locals and appreciate the beautiful scenery. After the train ride enjoy a private tour driving through downtown to explore the city centre and its fabulous mix of architecture and sites. The streets are filled with historical buildings, many of which have a faded colonial charm not seen elsewhere in Asia. 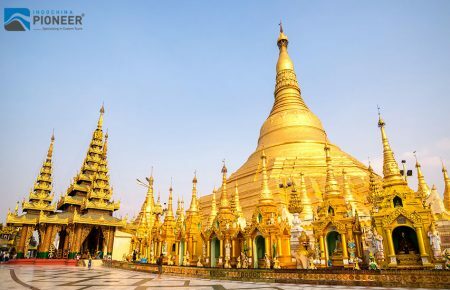 You’ll start at the post office – a lovely historic building, passing by Strand Hotel, and the Buddhist landmarks of Sule Paya, Mahabandoola Garden and Independence Monument along the way. Photo stop at the Karaweik Hall royal floating barge. 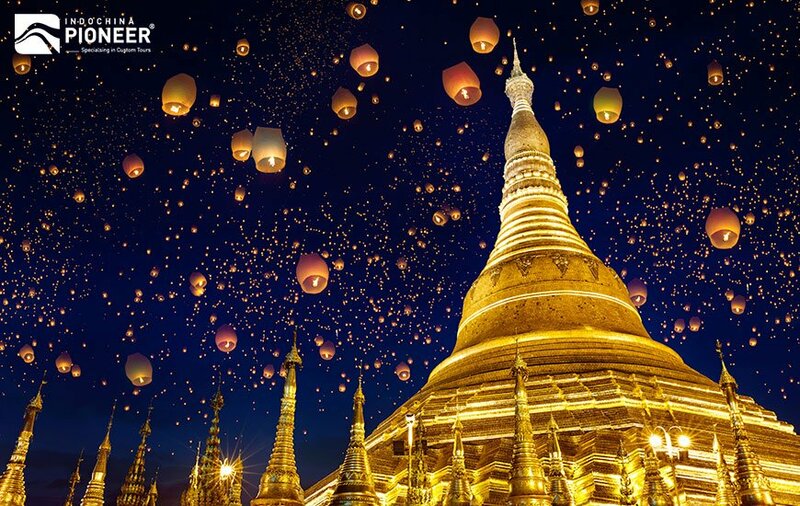 Nothing will prepare you for Shwedagon Pagoda, with its glittering gold stupa. At the pagoda observe local pilgrims and monks offering their devotions and enjoy the amazing sunset view at Shwedagon pagoda. After breakfast, day at leisure until transfer to airport for International departure flight. 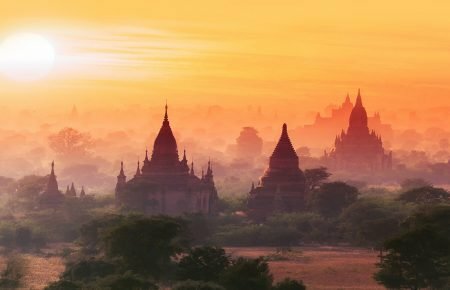 Myanmar (previously known as Burma) is a perfect destination for travelers looking for a unique get-away to a beautiful and exotic locale. 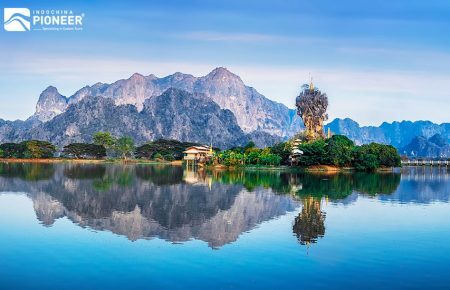 This tropical country offers travelers an amazing landscape and a rich cultural heritage, influenced by Southeast Asia’s traditions. 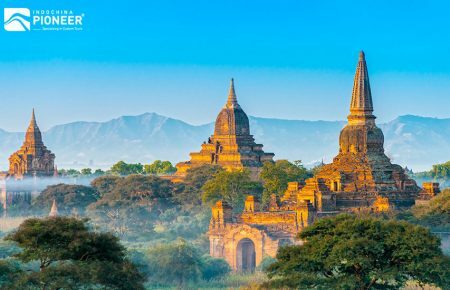 However, as a country that has only just recently opened its doors to tourism, Burma still retains an air of mystery, making it all the more intriguing. With nearly 2,000 miles of coastline and a handful of mountain ranges, Myanmar has more than its share in natural beauty. 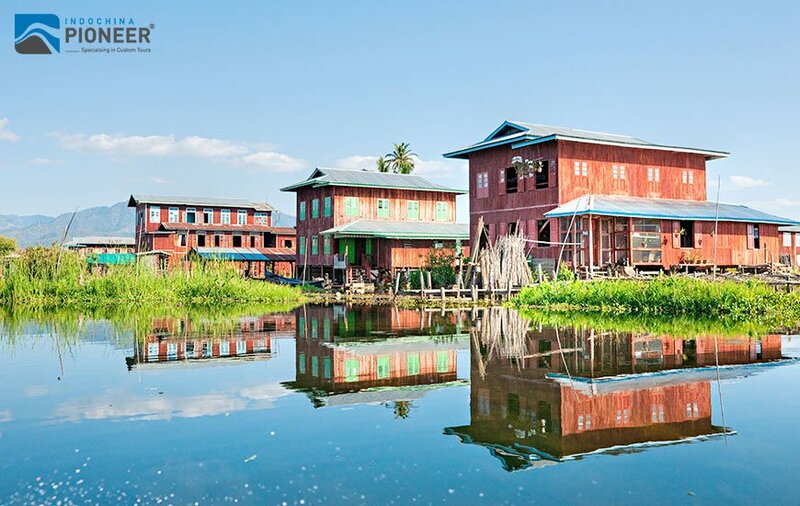 Trek through the rolling green hills, discover Sagar to the south of Inle Lake, cycle to markets and ruins, boat around floating villages, sample well-spiced Burmese cuisine, and visit mysterious temples. 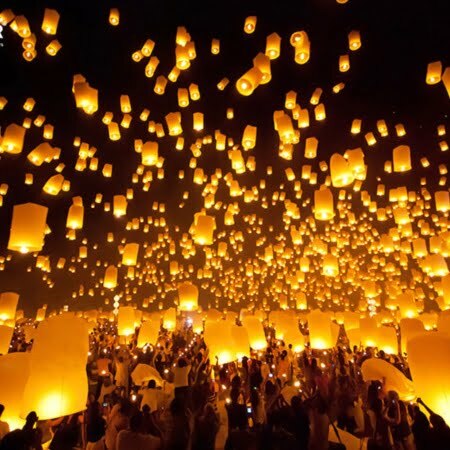 You will get to not only discover, but also really live in this unique cultural atmosphere. 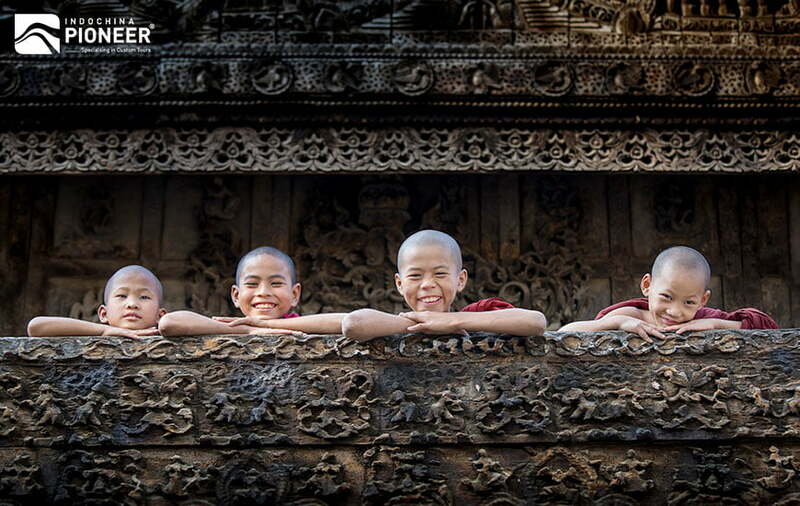 In exploring Myanmar, you will also enjoy the perfect combination of luxury and adventure. 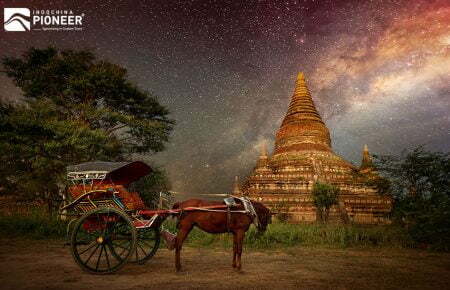 • Breathtaking Bagan bags a well-deserved top spot on this list of the best places to visit in Myanmar. 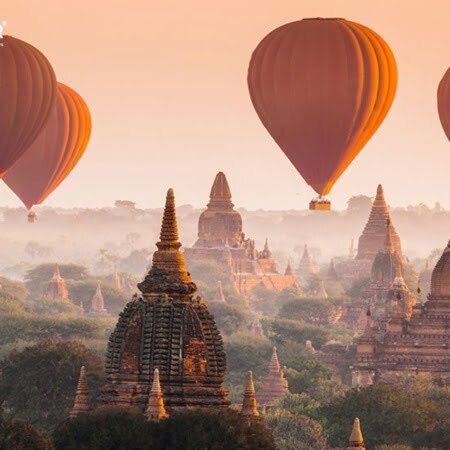 Seeing Bagan by the hot-balloon is becoming increasingly popular, and offers a truly unique view of this 26-square-mile land of temples. 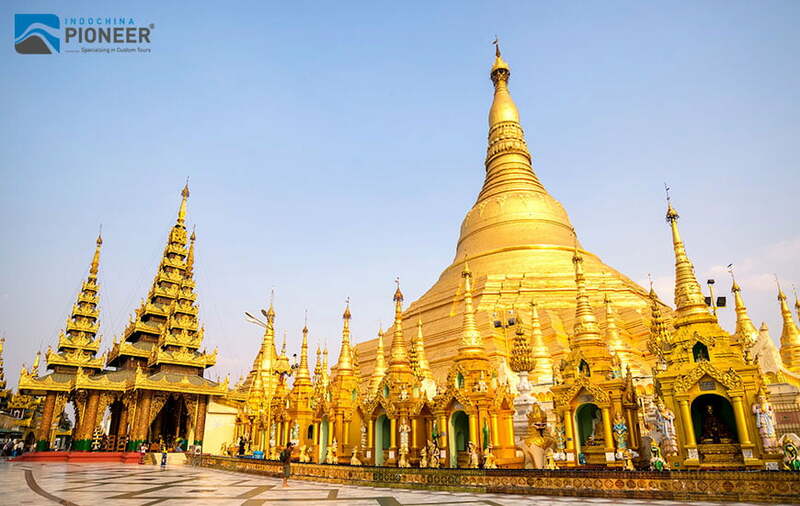 • The Shwedagon Pagoda, also known as the Golden Pagoda, is a gilded stupa located in Yangon, Myanmar. The 99-meter-tall (325 ft) pagoda is situated on Singuttara Hill, to the west of Kandawgyi Lake, and dominates the Yangon skyline. • Inle Lake – for an excellent view of the verdant, bucolic side of Myanmar. 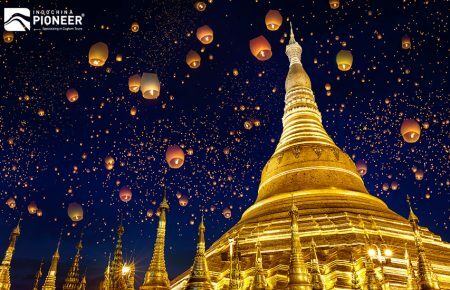 • Kyaiktiyo Pagoda (Golden Rock ), a small pagoda built on the top of a granite boulder covered with gold leaves pasted on by its male devotees. 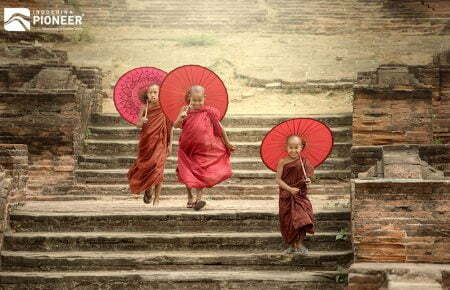 • Shwenandaw Monastery is a historic Buddhist monastery located near Mandalay Hill, Mandalay Region, Myanmar. Like most Southeast Asian countries, Myanmar has two main seasons: dry and wet. The dry season runs from October to May, and the wet season from June to October. 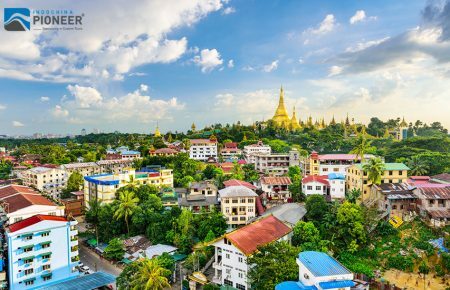 Generally, most people prefer to travel during the drier months, but even during the wet season, the northern and central regions of Myanmar are cooler and drier than the southern parts, making year-round travel possible. Most foreign nationals require a visa to enter Myanmar. 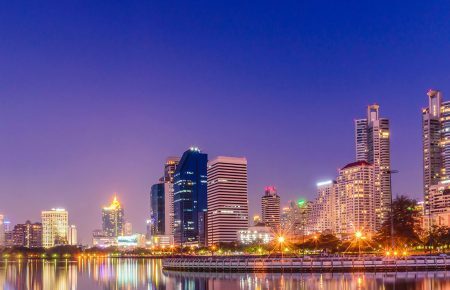 Visa-free travel for 14 days, or longer in some cases, is permitted only to citizens of Thailand, Singapore, Vietnam, Philippines, Indonesia, Brunei, Cambodia, and Laos. 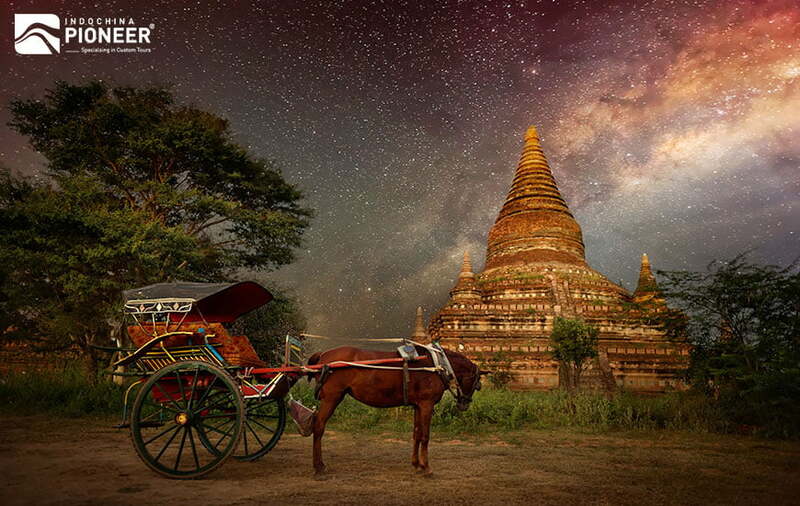 In addition to getting visas at embassies and consulates, Myanmar has an online e-visa system. 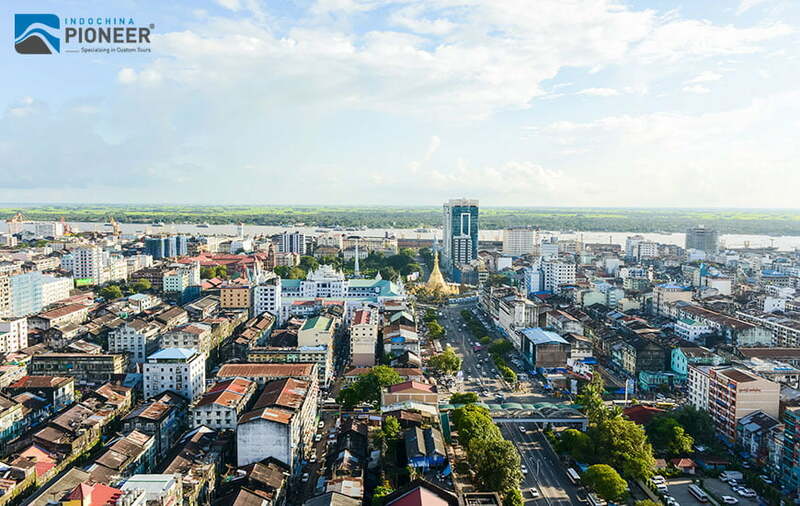 It is designed to make the process of application simpler for visitors – particularly those from countries that do not have a Burmese embassy. For e-visa applications, please visit the official Ministry of Immigration e-visa website. 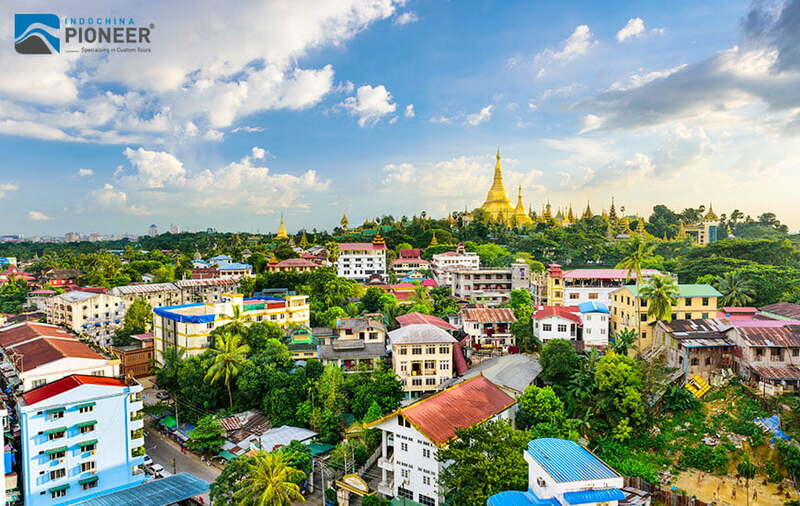 E-visas are currently only valid for entry at Myanmar’s three main international airports: Yangon, Mandalay and Nay Pyi Taw, as well as overland travel to Myanmar via the Thai-Myanmar border points of Mae Sai / Tachileik, Mae Sot / Myawaddy and Ranong / Kawthaung only. The e-visa is not valid for China, India, Thai or any other land border entry points. Tourist visas are valid for 28 days and costs around USD$50, which can be extended an extra 14 days at a cost of USD$3 per day, plus a one-time USD$3 administration fee. 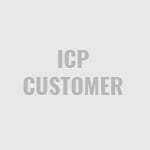 It is important to be ready with the correct change at your departure point as change will not be provided. 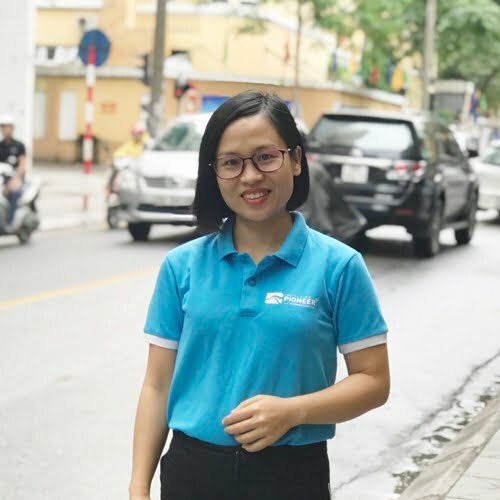 Bear in mind that if you overstay, you might encounter some difficulties booking travel and/or hotels during your overstay period, as not all service staff are aware of the overstay allowance. Do not apply for your visa too early: the period for visa validity (i.e. 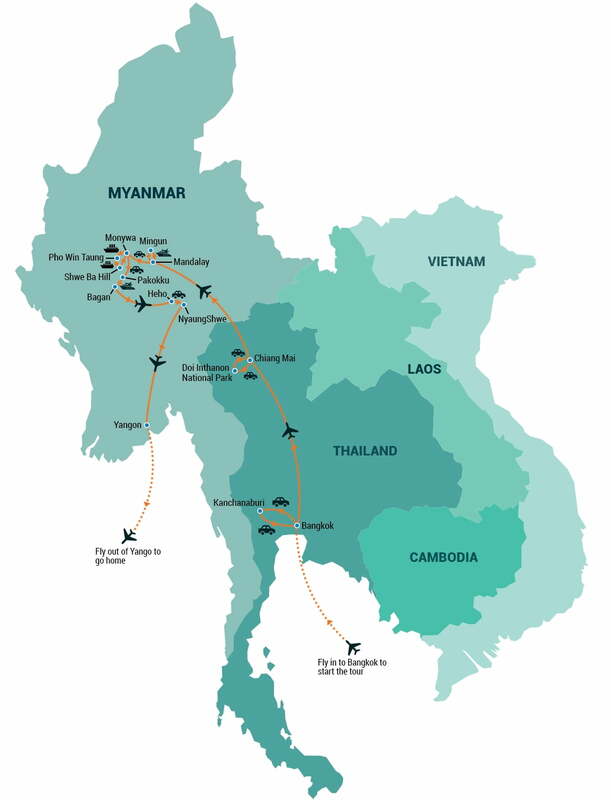 your Burmese entry date) may range from 1 to 3 months. Do not apply for your visa too late: embassies and consulates can take 2 weeks or more to process your application, but this varies from country to country. If you are from a country that does not have a Burmese embassy or consulate, it will take longer still. If you wish to apply for a physical visa, the visa photo criteria are 5 cm high x 3.5 cm wide on a white background, no glasses and no smiling. Thailand, the wondrous kingdom, the most popular tourist destination in Southeast Asia, and the only Southeast Asian nation that has never been colonized by a European power. 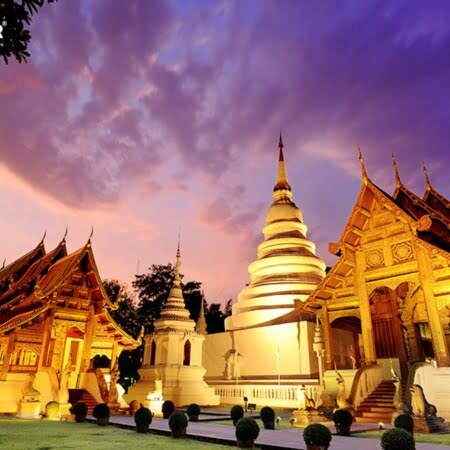 With endless attractions for visitors of all budgets and interests, Thailand is the paramount beacon beckoning travelers from all over the world to Southeast Asia. 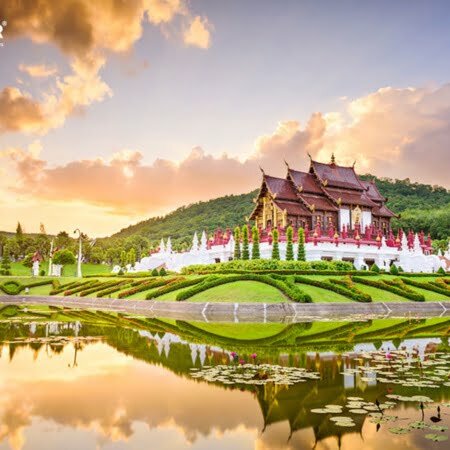 For those wanting to learn more about Thai culture, take a stroll through the impressive Buddhist temples, and join a cooking class to learn Thai culinary arts. More of a nature person? Explore the spectacular islands and bask on world-class beaches, see some exotic wildlife, and tour the country’s landscapes. Pattaya, Phuket and Koh Samui offer life in paradise with their miles of pristine sand and crystal water. Looking for a more modern experience? Shopaholics will find Bangkok a heaven with its millions of product types, brand names and prices at every corner, either at an affordable market or a luxury mall. The nightlife is also guaranteed to please the party crowd. 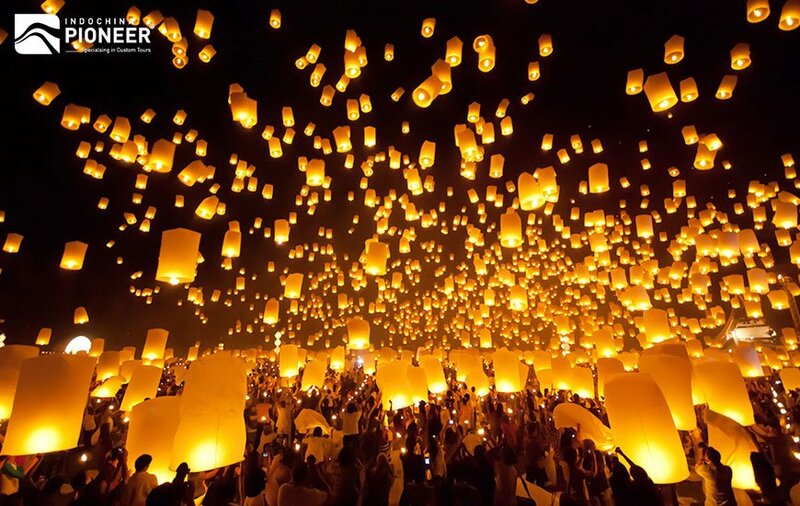 Most importantly, everywhere you go, you will be warmly greeted by the Thai locals, whose dazzling smiles established Thailand as the ‘land of smiles’. 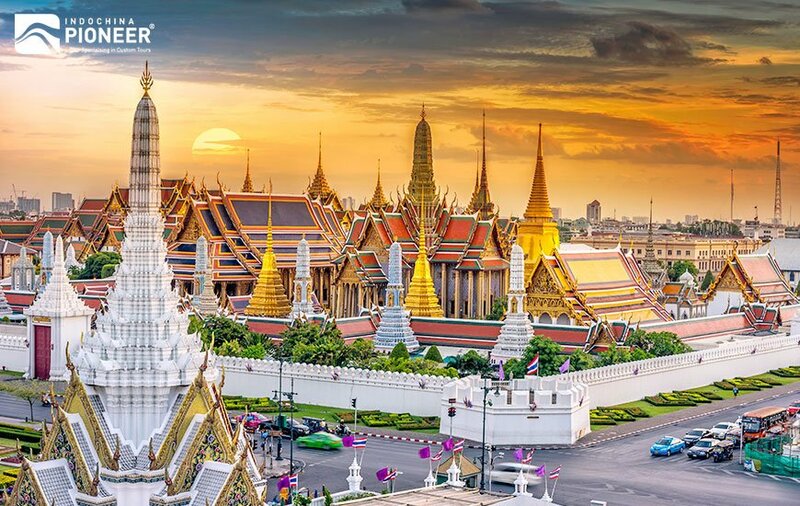 From five-star pampering, adrenaline-fueled activities, shopping in stylish boutiques, sun tanning on some of the best beaches in the world, to taste the fantastic cuisine, Thailand has something for everyone. The climate varies throughout this country, makes it possible to visit all year round. The best time to visit Thailand is between November and February when the weather is at its best. Much of the country experiences a typically tropical climate consisting of two seasons: dry and wet. In northern Thailand, the dry season with cooler temperatures falls between November and May, with heavy rainfall between June and October. In the south, the climate differs between the east and west coasts. The weather on the east coast is good for most of the year, with the lowest rainfall in January and February, and the highest in November. The west coast is more favorable during the winter months when diving and snorkeling will be at its best. Passengers arriving via an international airport will be given a 30-day visa exemption stamp, however, those with back-to-back visa exempt entries might be questioned. As of December 31st, 2016, the number of visa exemption entries at a land border has been limited to two per the calendar year, for a maximum of 30 days each time. For those who would prefer to get a visa, a valid tourist visa offers a maximum of a 60-day stay. 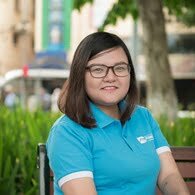 The Thai visa photo criteria are 6 cm high x 4 cm wide with a bright background color. 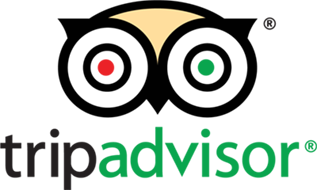 The citizens of countries that are eligible for a VOA to enter Thailand can NOT enter Thailand at any Thai / Cambodian border: Andorra, Bhutan, Bulgaria, China, Cyprus, Ethiopia, India, Kazakhstan, Latvia, Lithuania, Maldives, Malta, Mauritius, Romania, San Marino, Saudi Arabia, Taiwan, Ukraine, Uzbekistan. All other foreign citizens must obtain a Thai visa from their nearest Thai embassy/consulate. Note: It is recommended to keep a copy or record with your camera, your passport, visa, most recent entry stamp, and your embarkation card. 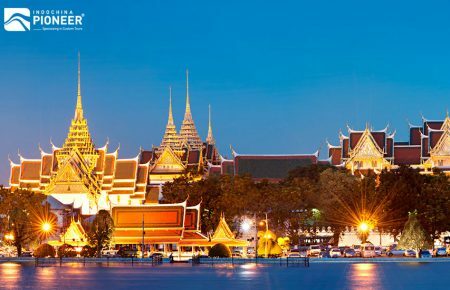 Let's check out what best Thailand has to offer: Bangkok, Ayutthaya, Chiang Mai, Phuket, Phang Nga Bay.